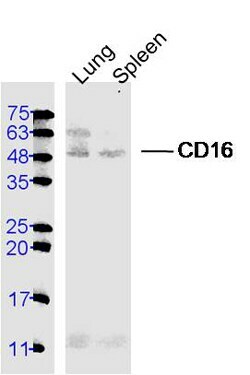 Rabbit polyclonal CD16 antibody. Validated in WB, IHC, Flow Cyt and tested in Mouse, Rat, Human. Cited in 3 publication(s). Immunogen corresponding to synthetic peptide. Synthetic peptide within Human CD16 aa 145-195 conjugated to Keyhole Limpet Haemocyanin (KLH). The exact sequence is proprietary. U937 cells; Human lung cancer, human glioma and mouse spleen tissues. Our Abpromise guarantee covers the use of ab203883 in the following tested applications. When using a fluorescent probe the recommended dilution is 1/50 – 1/200. WB 1/100 - 1/1000. Predicted molecular weight: 29 kDa. Receptor for the Fc region of IgG. Binds complexed or aggregated IgG and also monomeric IgG. Mediates antibody-dependent cellular cytotoxicity (ADCC) and other antibody-dependent responses, such as phagocytosis. Expressed on natural killer cells, macrophages, subpopulation of T-cells, immature thymocytes and placental trophoblasts. Glycosylated. Contains high mannose- and complex-type oligosaccharides. The soluble form is produced by a proteolytic cleavage. Cell membrane. Secreted. Exists also as a soluble receptor. 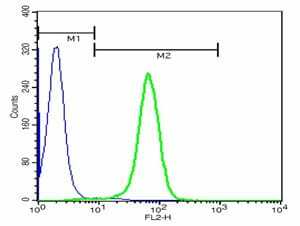 U937 cells probed with ab203883 at a 1/100 for 40 minutes followed by incubation with Goat Anti-Rabbit IgG PE conjugated secondary at 1/100 (green) for 40 minutes compared to control cells (blue). Immunohistochemical analysis of formalin-fixed, paraffin-embedded human glioma tissue labeling CD16 with ab203883 at 1/200 dilution followed by conjugation to the secondary antibody and DAB staining. Immunohistochemical analysis of formalin-fixed, paraffin-embedded human lung cancer tissue labeling CD16 with ab203883 at 1/200 dilution followed by Goat Anti-Rabbit IgG, Cy3 conjugated secondary antibody at 1/200 dilution. Immunohistochemical analysis of formalin-fixed, paraffin-embedded mouse spleen tissue labeling CD16 with ab203883 at 1/200 dilution followed by conjugation to the secondary antibody and DAB staining. Publishing research using ab203883? Please let us know so that we can cite the reference in this datasheet. There are currently no Customer reviews or Questions for ab203883.